Well that's it... we've spent the last 30 days lifting bits of ourselves away from the floor, today we return to standing via just our hands and toes. Just in case we didn't feel humble enough yesterday, #controlbalance is here to make sure of it today! We've spent several rolling exercises getting that 'pelvis suspended from ceiling' feeling. Now we're on the bare minimum of contact with the floor and planning to switch legs too. I have to say, Charlotte's doing an awesome job here! Oh #rocking, how we love you! This one has to be on an awful lot of 'most challenging exercises' lists... Katharine's and Louise's included! I honestly feel like I'm about to snap in half if I'm not really supported from my abs, yet my rocker rocks like a plank on all but the bendiest of days. Thank you Mr Pilates for well and truly humbling me on day 29. What's coming after #kneelingsidekick other than #sidebend?! Those 2 points of support are smaller AND further away from each other... is there anything else we can lift from the floor here?! Not a lot but I'm sure Mr Pilates has some more treats lined up for the final 5 days still to come. #swimming is our organiser of left and right sides whilst we're on the front of the body. Coming up in the first of the #legpulls, this form levitates for a bit of extra fun. Anyone for a #corkscrew sitting up? #hiptwist is another reprise with added oomph. Smile! Not a lot left on the floor now, in fact that pelvis is coming up too in a couple of days, look out for how this takes off into #legpulls back. Remember day 2 #rollup? Well today in #teaser, we're going to roll the spine down a little from here into that difficult spot, then up again, then down again, then up again. Bit like #spinestretch on a whole new angle. I've heard a tale that Joe would 'tease' his clients by holding a dollar bill just beyond their reach... don't know if there's any truth in that. I've got a few clients who have renamed it Malteser in an effort to make it an all round nicer experience though. #sidekick is one of a little bunch of actions that Rachel's working on right now, as they reveal so much about discrepancies between the right and left sides. We're going to take it up a notch soon in #kneelingsidekick, but for now we can work the anchor through the pelvis and bottom leg whilst getting the underneath shoulder connected in anticipation. Wow, here's a biggie. #jackknife makes it to Katharine's top 3 challenges (along with #boomerang and #rocking). It's a pretty big checklist of skills that we've been building up... antigravity lift from #rollover, #scissors, #bicycle. Long neck from #neckpull. Arms pressing and hugging towards midline from #doublelegkick and a host of its mates. And then just lift both legs to the ceiling. Fast. OK? 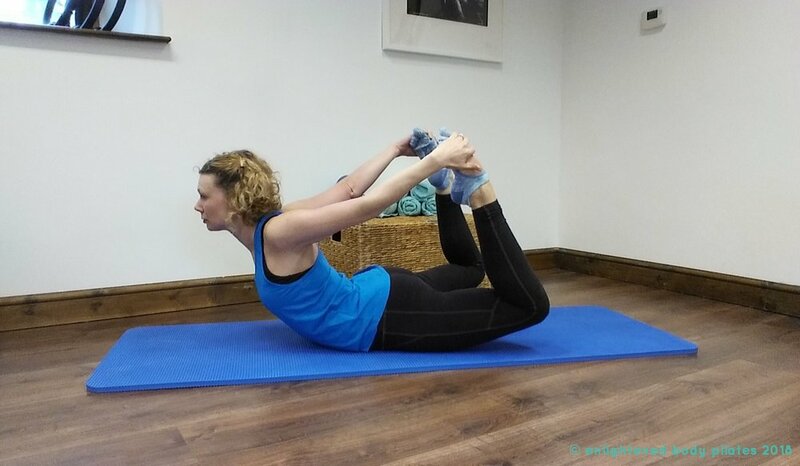 Ah, now we're getting to a point where we REALLY need our balance between the right and left sides of the body, so #spinetwist is a chance to get our diagonals connected with a bit more oomph than our first shallower spirals. Anyone miss #crisscross...? Well here it is sitting up! The legs are still reaching to anchor the spiral - here reach the left leg to complete the action (and Katharine aim to stop that right arm from drifting forward). Once again, what we first did with one leg, now happens with two in the unsurprisingly-named #doublelegkick. We're working on drawing the arms toward the midline behind the body too, which is going to help us in the Scissors and Bicycle coming up in a couple of days. We had a good time earlier on opening out the whole of the back of the body whilst finding the power in the front... time to switch it around in the #onelegkick. This one is a place to focus on abdominal connection still to keep the pelvis from dancing about and stealing the stretch from the front of the hip and thigh whilst we work powerfully through the back of thigh and seat. Of course it's setting us up for something to come too... what happens if you look at this upside down? (Answer on day 17! We've spent several days rolling the spine now, but for every roll, there's been an un-roll too, lengthening the spine along the mat, elongating the spine's curves with a strong powerhouse at the root. Now we're ready to open the spine out further into our first backbends and here comes #swandive. Many of us have a bit of a love/hate relationship with Swan Dive and the preparatory Swan. Louise says "it used to feel really challenging for me. I didn’t necessarily hate it, but it was hard to even feel those vertebrae in my upper back, let alone move them! Practice, practice, practice. Now it feels great, achievable and functionally it’s a really useful exercise to help my posture." "I love teaching swan, for the simple reason that it felt so liberating to me when I finally 'got it'. I like to share that. Plus, movement-wise, I think it’s what we all need a little bit of." So, for all of you reading on your mobile device... time for some Swan to alleviate the text neck!